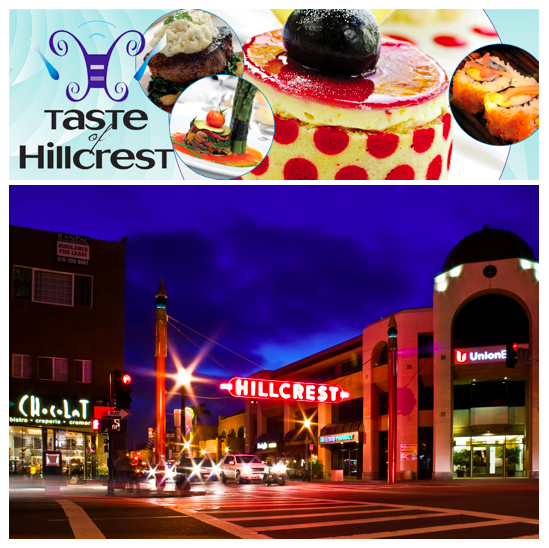 Take your palate by the hand and embark on your culinary tour of the world at the 14th Annual Taste of Hillcrest taking place on Saturday, April 19 from 12 - 4pm. Over 40 sumptuous restaurants will be serving bites, so delectable; they will have you feeling like a Culinary Attaché. From quaint cafés and budding bistros, to five-star dining decadence - enjoy all the global cuisine Hillcrest has to offer. Sample flavors of the Middle East, from Eba’s Lounge and Bistro, Spices of the “East” from Bombay Exotic Cuisine of India, and feel good classics from Harvey Milk’s American Diner. But don’t forget to indulge in some sweet delights at the famed D Bar San Diego and Babycakes! Tickets to this not-to-be-missed event are just $30 in advance, and $35 on the day of the event, with all proceeds benefiting the Hillcrest Business Association. Don’t let your taste buds down! Become a part of the fabulous tradition and purchase your ticket in advance, as this event promises to once again, be an absolute sell-out! For further information and ticket purchases, please visit TasteofHillcrest.com or call (619)-233-5008.